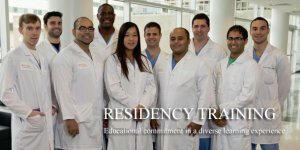 The Orthopaedic Residency Program at the Rutgers New Jersey Medical School and Affiliated Hospitals is a five-year program. Our subspecialty coverage is complete and comprehensive. The mix of facilities provides a diversity of patients, environments, and pathology, which we feel is necessary for a well-rounded surgical education. Our research facility includes molecular, biomechanical, and biochemical laboratories and is an integral part of the residents' experience. More importantly, we emphasize the fundamentals of thinking and planning, as well as performing orthopaedic surgery. It is our goal to graduate well rounded, well-read, skillful surgeons who have the necessary skills and experience to choose either academic or private practices. This, as all residency programs, will undergo change over time, but our commitment to train humane, broadminded and competent orthopaedic surgeons will not. Our Residents have 2 month long rotations 6 times per year. We have dedicated 3-hour educational sessions every Thursday morning and follow a reading schedule and year-long OrthoBullets study plan. In addition, journal club is held once per month during the Thursday dedicated educational session as well as once per month during respective rotations. Additionally, educational conferences and small group discussions are held weekly on respective services described below. Our Residents supplement their education by attending national training conferences such as the AO Basic course, AANA arthroscopy course, Miller Review Course, and the AAOS Annual Meeting. Every weekday morning from 6:45am-7:30am residents meet with the on-call attendings to present patients and review imaging from consults during the previous day. A multidisciplinary tumor conference, consisting of musculoskeletal radiologists, pathologists, and orthopaedic oncologists is held every Thursday from 3:30 -4:30pm, during which patients’ history, imaging studies, and pathology slides are reviewed and discussed, and complex treatment regimens are planned. Every Tuesday and Wednesday, the pediatric team and rotating students, as well as the spine/peds/call resident will gather over breakfast for an informal, but in-depth discussion of a pediatric orthopaedic topic of choice based on reading from Lovell & Winter Pediatric Orthopaedic Textbook. The spine team meets Mondays to review in-training exam topics from the spine section out of OKU such as Cervical trauma, Thoracolumbar trauma, Cervical Degenerative Disease, Lumbar degenerative disease, Lumbar spondylolisthesis, Spine Infections. In addition, Journal Club is held Fridays. As the NJ State Trauma Center, UH provides the principal training in management of multiply-injured patients and major orthopaedic trauma. All orthopaedic subspecialties are amply represented as well. Residents spend time on the Orthopaedic Trauma, Spine, Oncology, Hand, Foot and Ankle, Pediatrics, Adult Reconstruction, and Sports services. During PGY-1 thru PGY-5 years, residents will spend time on rotations occurring at University Hospital. During the PGY-2 and PGY-3 years, residents rotate at Overlook Hospital, which is a community based Orthopaedic Practice. The residents work with both members of the full time faculty at New Jersey Medical School, as well as a number of part time-teaching faculty whom have offices and/or operate at Overlook Hospital. Residents gain early operative experience in general community orthopaedic trauma as well has exposure to foot and ankle, spine, hand, sports, and adult reconstruction. During the PGY-4 and PGY-5 years, residents rotate at Hackensack University Hospital. Residents on this rotation gain clinical experiences in adult reconstruction, sports medicine/arthroscopy, shoulder arthroplasty, and spine. It also provides the opportunity for residents to gain experience in other subspecialties they may be interested in. During the PGY-5 year, residents rotate at Mt. Sinai Beth Israel Medical Center. Residents gain a highly focused experience with joint replacement and adult reconstruction. They are under the supervision of Dr. David Drucker, a fellowship-trained joint replacement surgeon. During the PGY-1 and PGY-3 years residents rotate at Newark Beth Israel Medical Center. The medical center provides further exposure to Orthopaedics in a community based setting. Residents will gain experience in general orthopaedics as well as pediatrics, sports medicine, adult reconstruction and hand surgery. Over the past 15 years, our graduates have achieved 100% pass rate on the written boards. The diversity of our training sites gives our residents exposure to all orthopaedic subspecialties in varied settings from a major trauma center in an urban setting to a private physician's office in suburbia. The Rutgers-NJMS orthopedic surgery residency program participates in the NRMP. In order to apply, the following information must be provided by November 1, 2017. Completed ERAS application including 3 letters of recommendation, with at least one coming from a clinical Orthopaedist. Foreign graduates must have either US citizenship, a green card or ECFMG J1 visa sponsorship. The orthopedic department welcomes 4th year medical students from United Stated medical schools to participate in a 4 week rotation. Interested students can apply through the VSAS application.